According to ChemOrbis, Indonesia’s PET market is seen catching up with the firmer trend in Asia this week after domestic producers issued up to three-digit hikes on their local prices pointing to higher feedstock costs. Following an explosion at a Chinese PX plant, which makes up 12% of the country’s total PX capacity, spot prices for PX have climbed by over $60/ton week over week. China’s Dragon Aromatics’ PX plant located in Gulei, Zhangzhou, Fujian province was hit by an explosion on April 6. The plant, which has a total PX capacity of 1.6 million tons/year, was shut for a month-long maintenance on March 14. However, the incident reportedly extended the duration of an ongoing maintenance which was initially scheduled to end in mid-April. 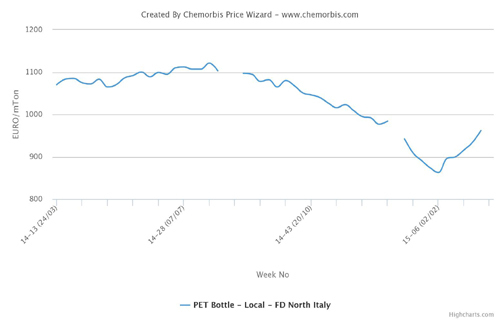 In addition to higher PX costs, spot prices for MEG and PTA are also suggesting weekly increases between $50/ton and $70/ton on a CFR China basis as per ChemOrbis. A domestic producer raised their PET prices by $100/ton compared to last week in the local market citing firmer upstream costs. A producer source said, “Demand is good and PET prices in China have gained ground as well.” A source from another domestic producer stated that demand for PET is good in the local market due to the upcoming Ramadan holidays and supply is sufficient. The source thinks that PET prices could post further increases of $20-30/ton considering higher PX and MEG prices. 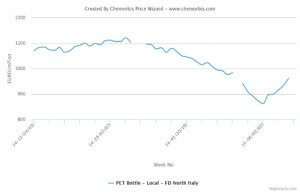 A converter confirmed that domestic suppliers issued increases between $70-100/ton on their latest PET offers, with the exception of a producer who raised their prices by $40-50/ton from their latest levels. The buyer said that he is not planning to make new purchases for now given his existing stocks and commented that the overall supply is sufficient.